All new and refurbished schools in the UK should be fitted with sprinklers, fire chiefs say. Currently, sprinklers are mandatory in new school buildings in Scotland and Wales, but not in England and Northern Ireland - and the National Fire Chiefs Council says that must change. London Fire Brigade Commissioner Dany Cotton accused the government of "playing with children's lives". Fire safety in public buildings like schools has come under close scrutiny since the Grenfell Tower fire in west London in June. Last year, the DfE in England began a consultation on new draft guidance which said building regulations no longer required "the installation of fire sprinkler suppression systems in school buildings for life safety". "Therefore," it added, "[guidelines] no longer include an expectation that most new school buildings will be fitted with them." "I just do not understand why it wouldn't be made compulsory and wouldn't be made a requirement to fit sprinklers in schools at new-build stage. "And what I don't want to see is a very large school fire to be the thing that brings about that change." The consultation was dropped after Grenfell so the guidance was never changed. It continues to state that it is the DfE's "expectation that all new schools will have sprinklers fitted", unless a school is "low risk" and installation "would not be good value for money". Despite this, less than a third of the 260 schools built since 2014 under the Schools Building Programme have sprinklers. The National Fire Chiefs Council said the proportion of new schools built with sprinklers has dropped from about 70% a decade ago to a third last year - and overall, in England and Wales, just 5% of schools have sprinklers. The construction industry says schools can be designed to be low fire risk with exit routes, fire doors and reinforced walls. Andrew Aylsbury, from construction firm Willmott Dixon, told the BBC: "I think if there were more money involved in school buildings I'd be looking at the need for new school places around the country - the bits of the school estate which are in really poor condition - rather than say that sprinklers was the first call. "Because intrinsically, pupils are safe in their schools today." The DfE says all schools must have a Fire Risk Assessment and new schools undergo an additional safety check while being designed. "It has always been the case that where the risk assessment recommends sprinklers in a school building, they must be installed," a spokesman added. 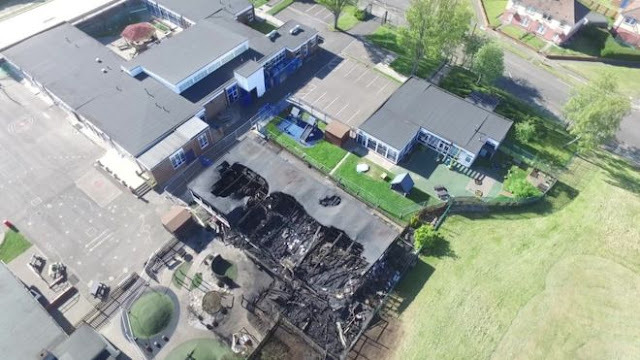 The Local Government Association said it "fully supports the installation of sprinklers in new school buildings as a cost-effective measure which can help save lives, protect property and improve firefighter safety". 0 Response to "Fire chiefs call for sprinklers in all UK schools"